Our SpotMeld™ system is a Refill Friction Stir Spot Weld (RFSSW) solution for aluminum and magnesium that provides an alternative to single-point joining processes like resistance spot welding, laser welding and riveting. 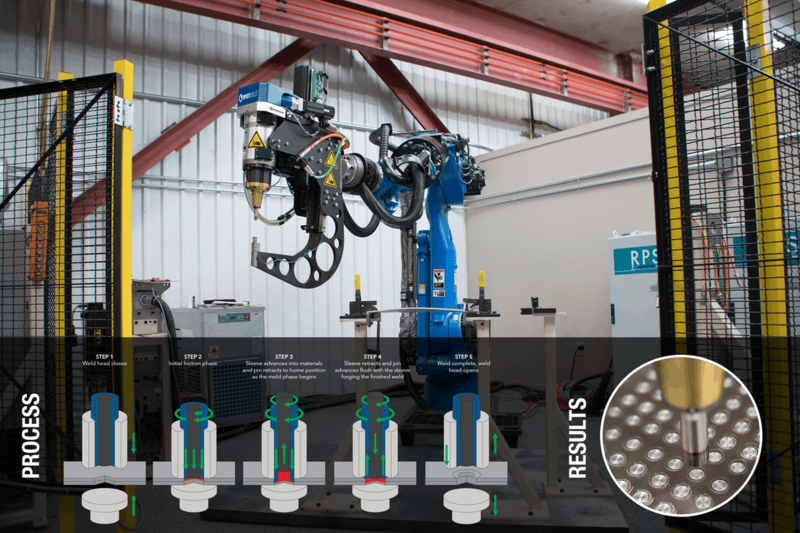 SpotMeld is an easier process to fixture and its automated tool change capability saves significant time as compared to self-piercing rivet changeover. Additionally, a variety of weld recipes can be used on demand by the robot controller, which results in a very flexible production system. Coldwater Machine Company’s robot mounted SpotMeld head can be integrated with a variety of robots, such as Yaskawa Motoman, Fanuc, Kuka, ABB and others.